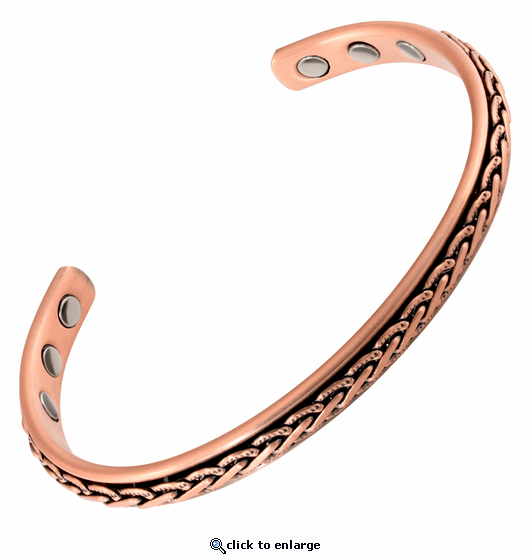 This is a finely crafted solid copper magnetic bracelet. Styled with antique twisted vines, this therapy bracelet has 6 powerful 3000 gauss neodymium rare earth bio north facing magnets and stainless steel magnet caps for added durability. This nickel free solid copper magnetic bracelet is just a bit wider than 1/3". The quality is outstanding for the price, very sturdy and heavyweight. Shipping was super fast and prompt. Since wearing the bracelet, the pain in my hands and shoulder have eased a bit. Plan on purchasing another. Thank you! The bracelet fit well and looked good (better than the picture in your ad.) Because copper can only kill microorganisms on the skin it comes in contact with I should have purchased a wider ban...this is not the bracelet\'s fault, but mine. It's me again! I have four sons and bought a copper magnetic cuff for each of them as one of their Christmas presents. This one was selected for my earth loving, environmentally conscience, vegetarian son and he loved it! It was a perfect fit for his personality. I was very happy with the quality and will be buying myself a cuff soon! The quality is exceptional for the price. I was not looking forward to winter and more pain in the cold Michigan climate. The bracelet has helped tremendously. I can get up off the couch and walk normal again without limping for the first ten feet. I'LL BE BACK. I ordered the wrong size of this beautiful bracelet. Customer service was very helpful online, and very respectful. I mailed the bracelets back, and received new ones within one week. I will order from this company again. Your Bracelet is much sturdier than a previous one I got elsewhere. It is also better looking and has more magnets and the same price! So your gets 3 thumbs up! twisted vines copper magnetic bracelet. I couldn't believe the fast delivery. Packaging was secure, and I loved the quality, and weight of the bracelet. I am thrilled, and it is stylish. My daughter and son both loved their bracelets. We were very satisfied with the price service and beauty of the pieces. Thanks! We were away on vacation in Maine and knew that you guys would be coming back from vacation on July 2nd. I was really hoping the twisted vines bracelet would be with my collected mail I pcked up, and it was.WOW!!! It is beyond all my expectations and quite the bang for the buck. It is substantial in weight and the design is very intricate. I bought a silver bracelet on the Placka in Athens for just a bit more money and this stands its grounds next to it. I love it, and since I have an arthritic neck, I'm also hoping for some medicinal relief. Great product. Looks just like the picture, very detailed with a look of quality for a great price. Nice!!! I bought this bracelet for my mum & she rang me a couple days after weaing it to let me know that the constant pain in her hands & fingers had started to ease. She is extremely happy with your product & will be buying jewelry through you in the future. Very pleased. Looks like jewelry and great value, prompt delivery and comfortable to wear. I bought these copper bracelets because I have carpel tunnel. The bracelets really do work for inflamation and pain! They are awesome I LOVE THEM! A little thicker and heavier than I would have preferred (can be a little challenging to get on/adjusted/off) - I've gone back to using a thinner, more maleable, copper bracelet, alternating it with a dedicated magnetic bracelet. But these are powerful, therapy-quality magnetics, and the fact that the magnets are all oriented in the correct north position shows good attention to detail. An excellent product, if you don't mind pumping a little iron (copper) getting it on and off!